Dragon Age: Inquisition is 1080p on PS4, 900p on Xbox One - "We Maximized the Current Potential of Each Platform"
It seems like BioWare and Electronic Arts decided to join in on the fun that Ubisoft recently whipped by revealing the current resolution and frame rate for Assassin’s Creed: Unity, as they just came forward and officially announced the specifications, that apparently matter the most now, for the upcoming highly anticipated action role-playing video game title known as Dragon Age: Inquisition. Unlike what the previous rumors claimed, it has been revealed that using the full potential of each console, the upcoming game will run at full HD native 1080p resolution on the PlayStation 4 and 900p on the Xbox One. This has been a hot week for resolution and frame rate figures. Ubisoft recently revealed that its upcoming historical adventure title known as Assassin’s Creed Unity will run at 900p resolution on both latest consoles, and now Electronic Arts and BioWare has announced that their upcoming title, called Dragon Age: Inquisition, will run at full HD 1080p resolution on the PlayStation 4 and 900p resolution on the Xbox One console. This official confirmation comes after the reports that stated that Dragon Age: Inquisition would run at 900p resolution across both latest consoles to achieve parity. 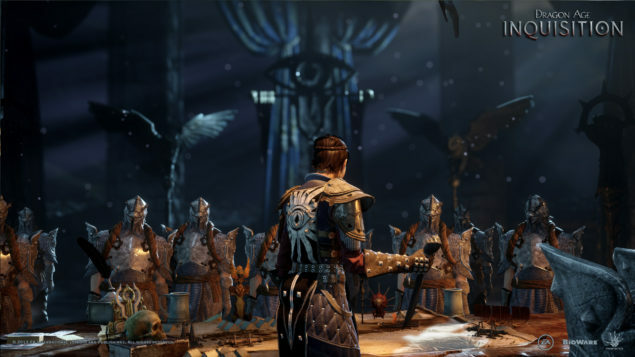 However unlike Ubisoft, BioWare did a forthright job directly and mentioned that instead of containing one console version to achieve parity with the other, Dragon Age: Inquisition has been “maximized for the current potential of each platform.” This means that the developer has squeezed all the hardware power that each console has to offer right now and the resolutions are the result obtained. The news was revealed via official Dragon Age Twitter account after consent with Electronic Arts. It seems like the last sentence was chosen shrewdly with a certain amount of dig at Ubisoft, considering that the consoles’ fan have been really outrageous towards the decision of the developer to lock the resolution of Assassin’s Creed Unity at 900p on both PlayStation 4 and Xbox One consoles, apparently to maintain parity and avoid any discussions concerning the performance differences between the latest consoles. What do you think regarding this announcement compared to Assassin’s Creed Unity’s resolution lock? Share your thoughts in the comments section below.